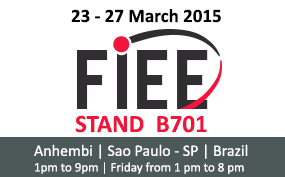 ABI Electronics will be represented at FIEE, Latin America's largest and most complete electrical, electronic, energy and automation event. FIEE is the ideal platform for exhibiting goods and services for an important business generating venue in these segments; an excellent opportunity to launch consumer trends; an excellent strategy to drive sales; strengthen the brand's image, quality and services; size up the competition; win over and captivate new customers; intensify relations with a highly qualified purchasing audience, nationally and internationally. For a chance to discover ABI's products and to discuss your requirements with our local partner RCBI, please visit us at stand B701.